Here at Confident Smile, we care about our patients. We have built our practices around patient education, a friendly atmosphere, and the highest level of dental care. We invest our time in communicating with our patients, establishing relationships and giving them the information they need. Our friendly, caring team members are also bilingual in both Spanish and English, offering more patients our comprehensive care. Patient comfort is paramount in our offices. We are very understanding of people who may feel apprehensive about receiving dental care, and we offer options for anxious patients to help them feel more comfortable. Because our upmost concern is our patients, we communicate with them to help them feel taken care of and at ease. 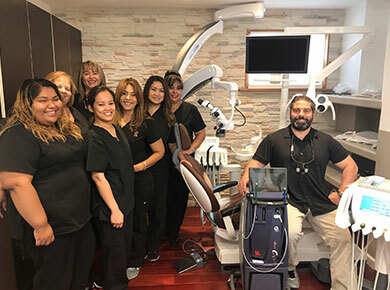 Dr. Hector Menendez invites you to our practices so you can receive comprehensive dental care in New Brunswick and Union, New Jersey, as well as the surrounding areas of Hightstown, Newark, Perth Amboy, and Summit, New Jersey. Our dentists provide a wide array of treatments, including EZ White® teeth whitening and complete implant procedures right here in our dental offices. Feel free to browse through our website to learn more about us. Please call us if you have any questions or if you want to schedule an appointment with us soon!